Born in Siberia in 1964. Studied at Kazan university and majored in astrophysics. While studying worked in planitarium. Since 1991 has worked as a photographer for the Dutch influential daily newspaper NRC-Handelsblad. Covered all war conflicts in the USSR and Eastern Europe. During 1991-1993 in collaboration with Dutch journalist Hubert Smeets published a book on Russia “Offended souls. Liberty in Russia” and with support from NRC-Handelsblad newspaper published a book “The collapse of the Soviet Empire”. The end of 1999 in collaboration with Dutch photographer Maurice Boyer published a book on the Kosovo events “Between Belgrad and Skopje. Photographs of the Kosovo War”. In 2005 his book on the consequences of the Soviet Union collapse “Heritage of an Empire” was published in the Netherlands, Belgium and Germany, exhibition in Amsterdam, Huis Marseille, Photography museum of the Netherlands. Since 2005 he’s been more interested in photo projects and been teaching documentary photography in the Rodchenko school of photography and Multimedia. Today he finishes his project on the Russian water borders “From the River to the Sea”. From 2010, in collaboration with Katja Bogachevskaja, he’s founder of Liberty.SU – documentary photography network on the territory of the former USSR. Oleg A. Klimov was born January 3, 1964 in Tomsk, an old University City in the heart of Siberia. After finishing school and serving the army, he moved to the city of Kazan to get a degree in astrophysics. However, in five years he fixed his choice on photojournalism. The local newspaper Vechernaya Kazan became his first employer. In the following years he worked for other national newspapers and magazines — Izvestia, Komsomolskaya Pravda, Ogonyok, Itogi, Medved. The failed coup d’etat made moved him further west — to Moscow, where he worked as a freelance photojournalist for AFP, photo agency Sygma and such periodicals as The Washington Post, Time Magazine, Le Monde, The Independent, The Times or Het Parool. For the Dutch newspaper NRC Handelsblad he has become a permanent photo correspondent in Russia. Besides, at the editorial request he made special reports in the Netherlands, Germany, Iraq, Bosnia, Serbia and Kosovo. Oleg Klimov is a Siberian and that is crucial, because Siberia is unique. This is a vast territory inhabited by prisoners and exiles, pioneers and refugees. Siberia is a part of Russia where tolerance and revolt co-exist and surprise no one. Siberia is a place where one can quarrel without having a serious argument and can be trusted as a friend without really being a friend. In short, Siberia is a different Russia. 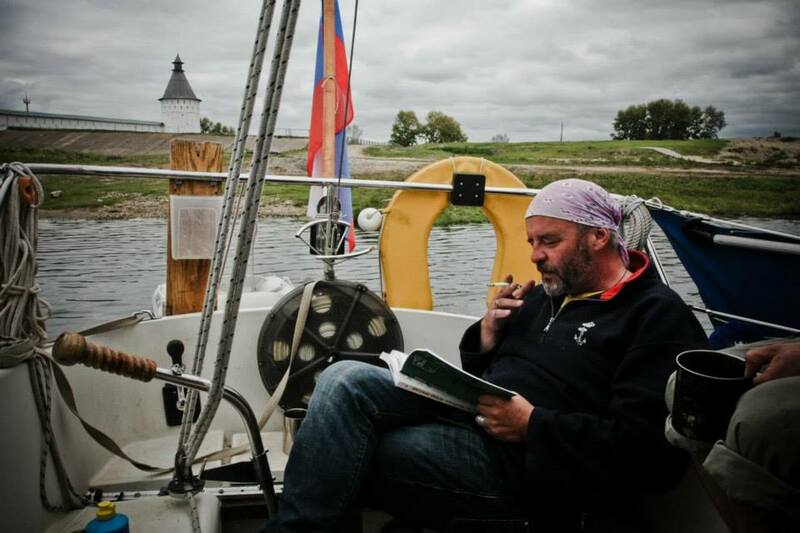 Oleg Klimov is still a son of the city of Kazan, the bridge between Europe and Asia. In Kazan he became an astrophysican — someone stuck between physics and philosophy. In Kazan he met people who grew dear to him and became a father. All of that happened before the moment when Klimov sold a couple of personal items, bought a Nikon and met a photographer Lyalya Kuznetsova. Astronomy gave the way to photography. All of that happened in the Soviet Union of the late 1980s — when glasnost mattered a lot, at least for journalists and photographers. Glasnost has opened Klimov’s eyes. The 1988 earthquake in Armenia revealed to him that misery and corruption go hand in hand. His perceptions of Man and World turned into one. Oleg Klimov I met in Kazan where I arrived in the spring of 1991 to make a reportage on teenage streetgangs that operated downtown. I was introduced to Klimov in the house of Ljalja Kuznetsova. The two photographers were discussing the respective superiority of art photography and photojournalism. Because I did not possess a good knowledge of the language, I stayed out of the conversation. Nonetheless, Klimov invited me to visit him at «home». Next morning the taxi arrived at «Vechernyaya Kazan» editorial building. Klimov invited me in. His home proved to be a 12 sq. m. darkroom that hosted some chemistry, fixing baths, one small sofa and nine ashtrays. I wrote my first article on Kazan for NRC Handelsblad. This was also Oleg Klimovïs first publication in this newspaper. Oleg Klimov does know and does not this world. That is where his strength lies. In the winter of 1992 in the city of Omsk, in a restaurant called Mayak, Oleg asked his Dutch colleague: «By the way, are there any writers in Holland» The question sounded insultingly unfair, but at the same time very logical. Holland is a land of painters and not writers. Why? In Holland, the conflicts are eliminated before they can become dangerous. If there is one country so opposite to Russia it is Holland. Klimov himself once noted while driving in a trafficjam on the highway between Amsterdam-Rotterdam early morning: «It’s morning. It’s raining. Burgers are heading in a hurry to their work. This is Holland.» And that’s to the point. Russia is different — extremes collide on every corner. Oleg Klimov thinks while he photographs and the other way around. This requires an explanation. While looking at his pictures there is never a 100% clarity on what is more important: his perception of the object or the representation of the object itself. Take, for instance, an image from the city of Sukhumi. There are three men in military uniform and a woman. The first man is playing the piano, another is cleaning his machinegun and the third one is embracing the crying woman. What is happening here? One can imagine almost anything. It is just a war, and it is here, in Abkhazia. Oleg Klimov is against wide-angle and telephoto lenses. It is dangerous. When an average sports photographer would use 300 mm shooting a football game, Klimov applies the maximum of 35 mm if it is possible. The consequences are often extraordinary. As he is choosing a unique, extremely close position to what he captures, the reality, however disgusting it may appear, acquires a human face. His war reportages are an illustration of this. Oleg Klimov is not a perfectionist. He does not worry about his negatives in particular. He does not think the camera a treasure either. The same can be said about his written works — the language is harsh, the sentences are incoherent. However, they possess their own style, and the reason is clear: using the typewriter, Klimov puts into words everything that he knows from his experience in photography. That is why the features of a writer and those of a photographer are combined in his personality. There are few people like him. Oleg Klimov hates the war but he can’t live without it, which is typical of all pacifists. They have very particular views on violence, even if they are difficult to grasp. They conceal their ideas under pacifist slogans. In this sense Klimov differs from typical pacifists described in books, as he is a pacifist with anarchist lifestyles — he belongs to reality. Oleg Klimov takes no notice of worn-out phrase. A foreigner sees only interesting images in Russia, so that he could have something to tell about it to his friends and relatives. Klimov sees these images too, but he is reluctant to capture them. For him, a camera is no more than a mean to capture the reality. He might as well use another tool to express what he is able to see and how he understands it. The result is: his images of Russia are more difficult to grasp than a foreigner would like it to be. Oleg Klimov changes his plans often. To him photography is not an aim, but a mean of a constant comparison of views and ideas about a Man and the world he lives in. A photographer can do it wherever he wishes: at the bar, at the filling station, aboard a ship. Oleg Klimov is poor at the bookkeeping, and it is not that surprising as it seems. All photographers are poor at counting money, which is the reason why the majority of them live in need, and only some of them become well off by lucky chance. That’s why they need an accountant’s services. As they are not aware of their poor count and do not trust bookkeepers, their bank accounts are less than modest. Those who command their money well are always surrounded by people. On the contrary, photographers are lonely. However, loneliness is important for their work, because it helps to grasp the truth. Oleg Klimov is constantly on the road. He seeks the truth which he needs and which he wants others to understand. If some people want to wipe out Saddam Husseinïs empire and everything that has to do with it, he sets off to the Garden of Eden. If people think that in Kosovo the Muslims are battling on one side and the Orthodox on the other, he finds a Muslim volunteer form Russia who proves this belief not to be true. It is his poor sense of orientation that brings him to places where reality is transparent. Oleg Klimov is not shy and at the same time, he is modest. Only the strongest personalities have the courage to confront him, though his only weapon is his camera. His demanding charm comes out of his timorously restrained manner. Moreover, it works everywhere. The language of humane photography does not need a dictionary.